It sometimes seems like every element of my childhood has been sifted through by Hollywood in recent years and sized up for a remake. Thankfully my most fondly remembered childhood classics haven’t gone into the reboot thresher yet — Cthulhu has so far honored my sacrifices and prevented any inklings of a Labyrinth remake. Some of the stuff I loved as a kid, however, I can freely admit could do well with a 21st century polish on it. 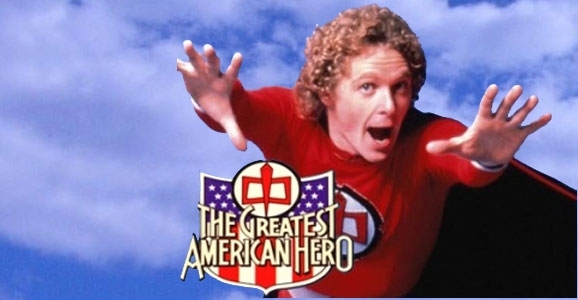 Case in point: The Greatest American Hero, which is getting a TV reboot courtesy of Phil Lord & Chris Millers, the writing/directing duo who helped make The Lego Movie so damn charming earlier this year. This is a combination of talent and material that I can get behind unapologetically. The original Greatest American Hero ran on ABC for three seasons beginning in 1981. Created by prolific TV producer Stephen J. Cannell, the show was the story of a mild-mannered teacher named Ralph (William Katt) who becomes a costumed crimefighter after being gifted with a super-suit by a group of benevolent aliens. Unfortunately for Ralph, he promptly loses the instruction manual, which means his superhero career involves more trial and error than the entire run of Smallville put together. Lord and Miller have some experience when it comes to rejiggering old TV shows in a worthwhile way, having beaten both the odds and pretty much everybody’s expectations by turning in not one, but two imminently watchable movies based on the dust-gathering Johnny Depp cop series 21 Jump Street. The script for the new Greatest American Hero pilot was penned by Rodney Rothman, one of the three credited writers on this year’s 22 Jump Street, so this is a well-honed team that will be tackling Hero, and one that gives me quite a bit of confidence that this will be a reboot worth watching. The one sour note: the show’s being developed by Fox. So yeah, even if it’s good, we probably shouldn’t get too attached. Still, The Greatest American Hero is one of those projects that’s actually perfectly suited for a modern revival. There are plenty of people my age who have fond nostalgic memories of the show, but most of us aren’t so passionate about it that the idea of a reboot inherently irks us, and there’s an entire generation younger than us who have no clue what the hell a Greatest American Hero is. If you asked them, they’d probably assume it was a reality show. …the new Greatest American Hero will chronicle inner-city teacher Isaac’s adventures after his discovery of a superhero suit that gives him superhuman abilities. Unfortunately for Isaac, he hates wearing the suit and has to learn how to use its powers by trial and error because he quickly misplaces the suit’s instructions. He also has to deal with a government handler who has very different objectives than him and struggles as to whether he should use his newfound gifts to help others or just himself. Fantastic! I loved that show.